Predictors of seizures after lateral skull base tumor resection: A retrospective study. Citation: Wu J, Li W. Predictors of seizures after lateral skull base tumor resection: A retrospective study. J Public Health Policy Plann. 2017;1(2):21-24. Copyright: © 2017 Wu/Li. This is an open-access article distributed under the terms of the Creative Commons Attribution License, which permits unrestricted use, distribution, and reproduction in any medium, provided the original author and source are credited. Objective: Lateral skull base tumor resection can lead to many complications, including seizures. The actual cause of such seizures is not well understood. We carried out this retrospective study to help identify predictors of post-lateral skull base tumor resection seizures. Methods: Twenty-eight American Society of Anesthesiologists (ASA) grade I-II adult patients, aged 18-62 years who underwent lateral skull base tumor resection were included in this retrospective study. Clinical data were obtained from electronic medical records. Data on of operation time, anesthesia time, end tidal CO2 and use of dexamethasone, mannitol and furosemide were obtained from electronic anesthesia records. MRI signal value of temporal lobe on MRI was determined from preoperative and postoperative MRI images take taking from on the lesion side and from the contralateral side. Data were analysed using the Mann-Whitney-Wilcoxon test or the Chi-square test. Results: Of the 28 subjects in this study, 4 had seizures after surgery, 2 generalized and 2 partial. These 4 subjects were put into a group called S+ and the remaining 24 subjects were put into a group called S-. Comparison of clinical data for members of the two groups showed no significant differences in basic clinical characteristics, aside from preoperative total protein levels, which were significantly lower in the S+ group compared to the S- group (66.50 ± 5.26 vs. 73.42 ± 5.34). Interestingly, operation time and anesthesia time were significantly shorter in the S+ group (3.34 ± 1.67 h and 3.77 ± 1.64 h, respectively) compared to the S- group (6.84 ± 2.60 h and 7.35 ± 2.64 h, respectively). In addition, postoperative MRI signal value on MRI was significantly higher in the S+ group compared to the Sgroup (509.50 ± 24.91 vs. 411.79 ± 72.70). Conclusion: Acute temporal lobe swelling may lead to seizures after lateral skull base surgery, especially after surgeries lasting less than 4 h.
Seizures, Cerebral edema, Skull base surgery, Acoustic neuroma, Glomus jugular tumor. Lateral skull base tumors, most commonly glomus jugular tumors or acoustic neuroma, are located deep inside the brain. Thorough and meticulous surgical resection is the primary treatment for the majority of these tumors. These lesions are generally difficult to reach, thus resection can lead to many complications, including facial nerve palsy, hearing loss, cerebrospinal fluid leak and postoperative headache [1-3] and seizures . Seizures can occur with many types of brain tumors, preoperatively and postoperatively. They often occur in supratentorial meningioma, the most common benign intracranial tumor. Patients with supratentorial meningioma frequently suffer from seizures after surgery, particularly those with tumors-associated brain edema . Infratentorial tumorectomy has been thought to have lower seizure risk, but in fact infratentorial tumorectomy is highly associated with postoperative seizures . Electroencephalographical findings showed abnormal electroencephalogram (EEG) patterns in patients with infratentorial tumors even without seizures . In a retrospective analysis of seizure incidence in 511 patients who underwent posterior possa operations, about 5.9% patients experienced seizures within 2 weeks postoperatively. The highest seizure incidence was in patients with acoustic schwanommas (9.09%) . In our practice we have observed that a fraction of patients undergoing lateral skull base tumor resection suffer seizures postoperatively. We performed this retrospective study with the goal of identifying predictors of post-operative seizures in these patients. This was a retrospective study. Approval of the research protocol was obtained from Eye, Ear, Nose and Throat Hospital Ethics Committee for Human Studies. 28 American Society of Anesthesiologists (ASA) grade I-II adult patients, aged 18-62 years, with body mass index (BMI) 18-30, who underwent lateral skull base tumor resection from July, 2014 to December, 2015 were included in the study (cases of acoustic neuroma, facial neuroma, jugular foramen tumor, temporal bone tumor, external auditory canal carcinoma and cerebellopontine angle tumor were 13, 4, 7, 2, 1 and 1, respectively). Exclusion criteria included history of epilepsy and incomplete medical information. Subjects who experienced post-operative seizures were defined as the S+ group; those who did not were defined as the S- group. The following data was obtained from electronic medical records: gender, age, body weight, height, preoperative and postoperative hemoglobin (HB), total protein, albumin, sodium ions (Na+), potassium ions (K+), calcium ions (Ca2+), chloride ions (Cl-), creatinine and urea nitrogen, preoperative heart rate (HR), systolic blood pressure (SBP), diastolic blood pressure (DBP) and blood glucose. Data on dexamethasone, mannitol and furosemide usage, end tidal CO2 (ETCO2), mean HR, SBP, DBP during the operation, operation time and anesthesia time were obtained from electronic anesthesia records. Magnetic resonance imaging (MRI) was acquiredwith a3T-MR-scanner (MagnetomVerio, Siemens Healthcare, Erlangen, Germany) preoperative and postoperative (48 hours after surgery), on the lesion side and the contralateral side. Temporal lobe MRI signal value was measured on MRI with Vue PACS software (Carestream, Rochester, NY, USA) in the T2-tse-tra window (Figure 1). Figure 1: Measurement of MRI signal valuein temporal lobe on MRI. Representative MRI images from a patient who experienced seizures (A, B) and a patient who did not experience seizures (C,D) showing areas measured. Lesion side: right (A), left (C). A,C: preoperative; B,D:postoperative. Continuous data are expressed as means (standard deviations, SDs) and categorical data are expressed as numbers of occurrence. Because of small sample size in the S+ group, comparisons of continuous data were performed using the Mann-Whitney-Wilcoxon test. Comparisons of categorical data were performed using the Chisquare test. Logistic regression analysis was not performed due to the small sample size. Statistical analyses were performed using Statistical Product and Service Solutions (SPSS) (version 20.0, IBM Corp., Armonk, NY, USA). The level of statistical significance was P<0.05. Of the 28 lateral skull base tumor resection patients included in this study, 4 had seizures in the recovery room after resection surgery. Two of these subjects experienced generalized seizures, and two experienced partial seizures. These patients were transferred to the postoperative intensive care unit (PICU), where seizures were controlled within 16 h using a combination of midazolam and sodium valproate. SPO2 never dropped below 95% during seizures or recovery period. These 4 patients were placed into the S+ group for the purposes of this study. The remaining 24 patients were placed into the Sgroup. Clinical characteristics of S+ and S- groups are shown and compared in Tables 1 and 2. There were no differences between the two groups in terms of gender, age, body weight and height. Table 1: Clinical characteristics of patients with and without postoperative seizures (Comparison analysis was performed using the Mann-Whitney-Wilcoxon test. S-: Patients who did not experience seizures; S+: Patients who did experience seizures; BMI: Body Mass Index; HR: Heart Rate; SBP: Systolic Blood Pressure; DBP: Diastolic Blood Pressure; HB: Hemoglobin; Na+: Sodium Ions; K+: Potassium Ions; Ca2+: Calcium Ions, Cl-: Chloride Ions; MRI: Magnetic Resonance Imaging; RR: Respiratory Rate; SPO2: Pulse Oxygen Saturation; ETCO2: End Tidal CO2; * P<0.05). Table 2: Use of dehydration drugs and gender in patients with and without seizures (Comparison analysis was performed using the Chi square test with SPSS. S-: Patients; who did not experience seizures; S+: Patients who did experience seizures; M: Male; F: Female. No significant differences were observed). No significant differences were observed in preoperative or postoperative HB, albumin, Na+, K+, Ca2+ or Cl- between the two groups. Preoperative creatinine,urea nitrogen, and blood glucose did not differ significantly between the two groups. HR, SBP, DBP, ETCO2 and use of dehydration drugs during the operation also did not differ between the two groups. However, we found that operation time and anesthesia time were significantly shorter in the S+ group (3.34 ± 1.67 h and 3.77 ± 1.64 h, respectively) compared to the S- group (6.84 ± 2.60 h and 7.35 ± 2.64 h, respectively). In addition, preoperative total protein levels were significantly lower in the S+ group compared to the S- group (66.50 ± 5.26 vs. 73.42 ± 5.34) and postoperative MRI signal value on MRI was significantly higher in the S+ group compared to the Sgroup (509.50 ± 24.91 vs. 411.79 ± 72.70). The risks and complications of postoperative seizures are broadly recognized by neurosurgeons, but the actual causes of postoperative seizures are not clear. Two possible mechanisms that have been suggested are extravascular leakage of blood components leading to free radical generation, and ion imbalance across cell membranes caused by ischemia or hypoxia . 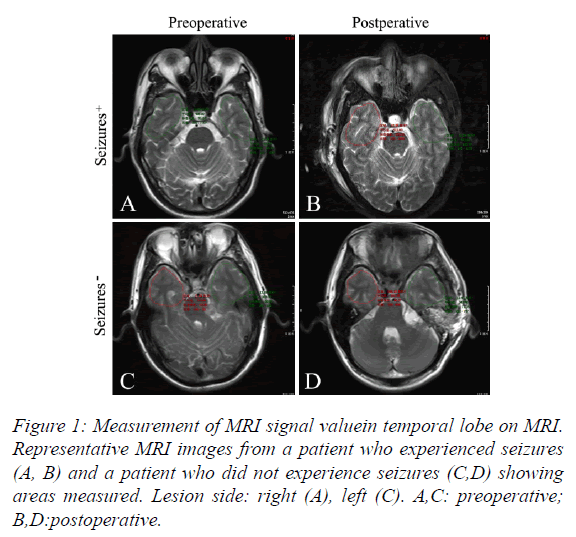 In this retrospective study, we found temporal lobe swelling after surgery in the S+ group, as evidenced by an increase in MRI signal value after surgery. In contrast, MRI signal value decreased after surgery in the S-group. Our current data does not allow us to distinguish whether the increased MRI signal value was the cause of seizures in the S+ group or the result of the seizures. A case has been reported in which transient brain edema in the medial temporal lobe was induced by seizure . Persistent restriction of cerebral diffusion and cytotoxic edema might be associated with seizures . Break down of the blood-brain barrier due to mitochondrial encephalomyopathy lactic acidosis can lead to vasogenic edema . The 4S+ patients in the present study suffered seizures in the recovery room not long after surgery. We postulate that these seizures could be due to abnormal discharge of temporal lobe neurons following disturbance of mitochondrial energy metabolism caused by pathological changes during surgery. Unfortunately, we did not do bispectral index monitor and examine of electrical activity of the brain monitoring during and after the surgery, so we are not able to confirm that hypothesis. There are many ways to decrease intracranial pressure (ICP) and reduce cerebral edema, including controlled hypotension , hyperventilation , dexamethasone  and dehydration agents such as mannitol and hypertonic saline . In the present study there was no significant difference in ETCO2, SBP and DBP during surgery between the S+ and Sgroups and use of dehydration agents did not differ between the two groups. Thus, the depth of anesthesia were maintained at the same levels between the two groups. We cannot infer that there were any differences in the depth of anaesthesia levels between the two groups. Acute temporal lobe edema may lead to seizures after lateral skull base surgery, especially after surgeries lasting less than 4 h. Further studies with larger sample size will be necessary to confirm these findings. The authors thank Feng Wang (Department of Radiology, Eye, Ear, Nose and Throat Hospital, Fudan University, Shanghai 200031, China) for measuring MRI signal valueon MRI. Schick B, Dlugaiczyk J. Surgery of the ear and the lateral skull base: Pitfalls and complications. GMS Curr Top Otorhinolaryngol Head Neck Surg. 2013;12:5. Soudry E, Turner JH, Nayak JV, et al. Endoscopic reconstruction of surgically created skull base defects: A systematic review. Otolaryngol Head Neck Surg. 2014;150:730-8. Odat H, Shin SH, Odat MA, et al. Facial nerve management in jugular paraganglioma surgery: A literature review. J Laryngol Otol. 2016;130:219-24. Heman-Ackah SE, Golfinos JG, Roland JJ. Management of surgical complications and failures in acoustic neuroma surgery. Otolaryngol Clin North Am. 2012;45:455-70. Englot DJ, Magill ST, Han SJ, et al. Seizures in supratentorial meningioma: A systematic review and meta-analysis. J Neurosurg. 2015;1-10. Park YS, Kim DS, Shim KW, et al. Factors contributing to resectability and seizure outcomes in 44 patients with ganglioglioma. Clin Neurol Neurosurg. 2008;110:667-73. Wojcik-Draczkowska H, Mazurkiewicz-Beldzinska M, Mankowska B, et al. Epileptic seizures as a manifestation of brain tumors: clinical and electroencephalographic correlations. Przegl Lek. 2003;60:42-4. Suri A, Mahapatra AK, Bithal P. Seizures following posterior fossa surgery. Br J Neurosurg. 1998;12:41-4. Manaka S, Ishijima B, Mayanagi Y. Postoperative seizures: Epidemiology, pathology and prophylaxis. Neurol Med Chir (Tokyo). 2003;43:589-600. Misumi Y, Hirano T, Matsumoto N, et al. Seizure-induced transient brain edema in the medial temporal lobe]. Rinsho Shinkeigaku. 2006;46:214-7. Graffeo CS, Snyder KA, Nasr DM, et al. Prognostic and mechanistic factors characterizing seizure-associated crossed cerebellar diaschisis. Neurocrit Care. 2016;24:258-63. Fryer RH, Bain JM, De-vivo DC. Mitochondrial encephalomyopathy lactic acidosis and stroke-like episodes (MELAS): A case report and critical reappraisal of treatment options. Pediatr Neurol. 2016;56:59-61. Bekker A, Sturaitis M, Bloom M, et al. The effect of dexmedetomidine on perioperative hemodynamics in patients undergoing craniotomy. Anesth Analg. 2008;107:1340-7. Gelb AW, Craen RA, Rao GS, et al. Does hyperventilation improve operating condition during supratentorial craniotomy? A multicenter randomized crossover trial. Anesth Analg. 2008;106:585-94. Leenders KL, Beaney RP, Brooks DJ, et al. Dexamethasone treatment of brain tumor patients: Effects on regional cerebral blood flow, blood volume and oxygen utilization. Neurology. 1985;35:1610-6. Mangat HS, Chiu YL, Gerber LM, et al. Hypertonic saline reduces cumulative and daily intracranial pressure burdens after severe traumatic brain injury. J Neurosurg. 2015;122:202-10.